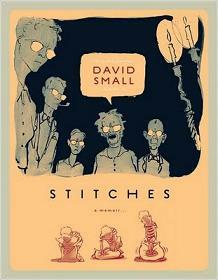 The artistic style of David Small immediately set the tone of the book as dark, gothic and significantly creepy. The memoir is the story of his boyhood growing up in the 1950s in the suburbs of Detroit. Small’s mother was an angry, repressed woman and his entire family including his father and older brother lived in a world of angry silence, never knowing how the others were feeling or what they were thinking. His father was a doctor; specifically a radiologist, and at that time, the science of radiology was still fairly new. David underwent “therapy” for his sickly sinuses by having his father zap him with ridiculous amounts of radiation in their basement. Consequently, when David was in his early teens he developed a growth on his neck and after various tests was admitted to the hospital for what he was told was routine surgery. He woke up with his neck “stitched up like a boot” and unable to talk since half of his vocal cords had been removed. David only found out later that it had been cancer. The novel’s art puts the reader in the mind of David as a little boy and later as a teenager. It is really interesting to see the world as he remembers seeing it, the eyes of all adults hidden by their glasses giving everyone an alien and closed appearance, which is exactly how the author must have felt in a house of no words or affection. Amplifying the intensity of silence was when he lost his own voice and the pictures become even more internalized, as dream sequences. If you pick up this book, I suggest reading it all in one sitting if possible. It probably won’t take more than 20-30 minutes and the result is an intensity of visually driven emotion that compliments the story. You can always go back later to look at the graphics in detail and appreciate the intricacies.